We’ve all seen the terrible images and stories coming out of Nepal over the past two weeks. You would have to have a heart of stone not to be moved and want to offer your help in any possible way. The British public has already donated millions of pounds and I’m sure this total will continue to rise over the coming days. However, it appears that there are people who are prepared to take advantage of this generosity, recently highlighted to me by Sallie Grayson from People and Places. Next Generation Nepal (NGN), an NGO that works hard to fight against child trafficking, is already seeing signs of children being moved to unregulated orphanages to elicit donations that will never reach the cause the donor intended. “Since the civil war in Nepal, traffickers have preyed on vulnerable families in rural areas, offering their children safety and an education in boarding schools or children’s homes in Kathmandu. In practice the children have been used as poverty commodities to raise money from well-meaning but naive donors and volunteers who support these ‘orphanages’ in the misplaced belief they are helping genuine orphans, or at least children who have no other choice than to be there. Why would volunteering with orphans be a bad thing you might ask? You just want to help right? Unfortunately volunteering with children isn’t that simple. There are many reasons, including the above, along with separation issues, child protection and the qualifications of volunteers not being up to scratch that can lead to more damage than good being done and that’s the last thing that any of us want. Read more on Orphanages.no, The Better Care Network, and Learning Service who created the video below. UNICEF Nepal are actively campaigning against this trend in travel as well. 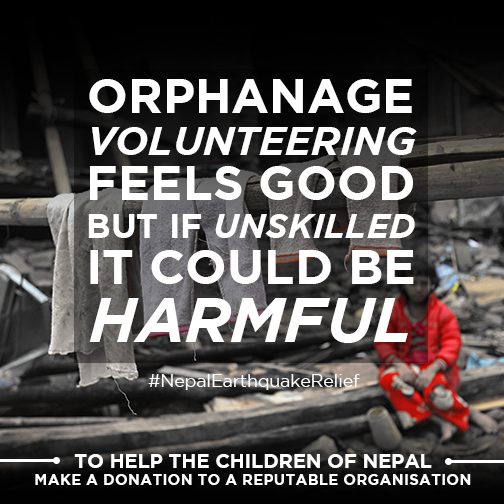 Firstly you can make an immediate difference by texting ‘Nepal’ to 70000 to give £5 to the DEC Appeal. If you want to go above and beyond how about organising a fundraiser for a reputable charity that is already helping in Nepal. Or you could write to your MP telling them what an important issue this is for you and you expect the next government (of whatever colour) to dedicate more resources. If you still want to visit Nepal and make a difference then wait until the crisis has passed and then consider booking a holiday to the country. I haven’t been but I’m yet to meet someone who doesn’t recommend it as an incredible tourist destination. Visit, invest in the economy and take it some of the country’s beauty. Make a difference in a safe way and enjoy being part of Nepal’s revival over the coming years. Orphanage tourism is spine chilling – I live in Viet Nam and I see it all the time. The one thing I ask people who are seeking out Orphanages to visit or volunteer at is whether they would be comfortable with unvetted strangers paying to come into their house and play with their children with limited or no supervision? If the answer is no, then I ask why is it okay for the children living in these orphanages? Thank you for the comment and I completely agree with your thoughts. Hopefully we can continue to educate people about the dangers of such tourism. PreviousGuest post – Charity PR: Stop the sensationalism!